In this seventy-first archive story by Kristian Bertel, we meet a begging woman in the city of Mumbai in Maharashtra India. In India you will sooner or later be confronted with begging people and children. Everyone and everyone has to find their own way of dealing with it and it is a difficult topic. Begging has grown at a significant rate in India and it is estimated that half a million people in India are beggars. In this portrait an elderly Indian beggar woman is begging in Mumbai, India. The moment you stop your car at the traffic red light, you will often see a dirty looking woman with a child in her arm come running to you or a little boy with running nose banging your car window or a handicapped old man asking for alms. This is a common sight in India. You will find many of these people in the railway stations, metro stations, tourist spots, in temples and in many areas where there is a regular crowd. At times, out of sheer pity or out of fear from being cursed by God or out of irritation, we tend to give them some coins or money and shoo them away. 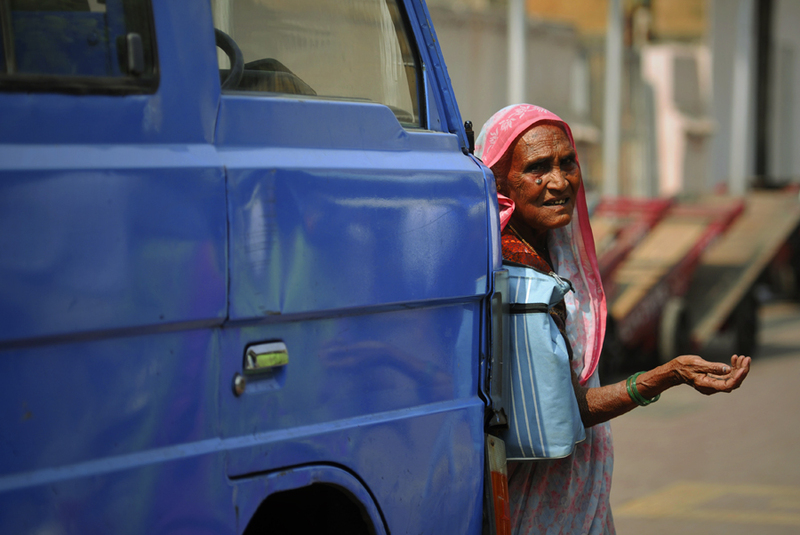 In this archive story you can read more about the causes of street begging in India. Begging is one of the most serious social issues in India. In spite of its rapid economic growth, India is a poverty-driven country, which is also leading to the growth of beggars in the country. Most of them come from Bangladesh and some of them are from India. There are few beggars in the country who actually are the real ones, who beg because they are handicapped, because of their inability to work or because they are old or blind or because they really need money for basic needs. There are many others who live far below the poverty line and opt for begging to earn their livelihood. In some cases, we find the entire family is involved in begging. The family members keep on increasing with marriage and birth and each of them gets into begging on streets or temples. Children of such families as the Boy begging in New Delhi do not go to school but only beg. They have to do begging because their family’s income is not enough to feed the entire family in a day. Here, poverty is one big reason for such a situation. But at the same time, begging is not the solution for such a situation. But poverty is just one side of the story. Poverty is real in India but not begging. Begging in India has become a big racket in the country. For many, begging is just like any other profession. They go out to earn money, not by working, but by begging. In fact, there are beggars in cities like Delhi, Noida, Gurgaon, Mumbai, Kolkata and so on. These people have their own leaders. Each leader allots a particular territory for a group of beggars and the day's earnings are shared among them. These beggars are so involved in begging that they do not want to work elsewhere. It is strange but true that some of these beggars earn in thousands and lakhs, much more than a normal middle class worker. It is very difficult to find out who is a real beggar and who is not because looks are very deceptive. Even the children with their dirty faces with pleading looks are properly trained to beg and look real. Sometimes our heart melts when we see a Young woman holding her tiny baby, begging on the streets. In most cases, the baby is found sleeping. This is a scam. Many sting operations have revealed that babies are rented to give credibility to begging. Sometimes, babies are drugged for the entire day so that they look sick and they can be easily carried from one area to another by the young women beggars. The beggars are trained to become very persistent while begging that you are bound to give them money. This is especially true for foreigners when they do not know how to react in such situations and ultimately give money to the beggars. Some of the young beggars also become anti-social elements of the India country. As a photographer and traveler in India it is hard to ignore the Beggary conditions in India. Families with children are partially abused by beggar gangs and have to give all the money in the evening. Therefore and also because we do not support child labor, he does not give these families and children any money. Also, he does not buy them any food that they sell back to the seller and then get the money. The children are always happy when you play or talk to them, ask them about their name and age or he gives them a single fruit that they can just eat. Then there are the begging people who are especially in tourist places that are demanding and touching you and a clear no and run away helps and then there are the begging people sitting on the roadside or walking around. The photographer always gives some money. It depresses one to see the people in need and at the same time to know that we can travel the world with our money. It is important for us to give something back to people here. But just the people who really need it and not any organisation. If one is unsure whether to give money or not, it helps to observe whether the Indians and Indians also give money. A journey through India can be challenging and sometimes exhausting. But at the same time, the land, the culture and its people are incredibly inspiring and we can learn so much from them. Be 100 percent committed to everything in India, be open, have respect but do not be afraid. The government, varied organizations, activists claim that many measures have been taken to abolish begging and it has been successful to a certain extent. But the trend of begging still continues. We are also to be blamed. We as Indians are very orthodox, God-fearing and have a religious frame of mind. This compels us to do charity. And one easy way is to visit a nearby temple and give alms to the beggars there. But as the citizens of this country, it is our moral responsibility to stop this menace and the best way is to stop giving alms. "- It might seem that we are very heartless in not giving money to a little child begging on the street, but this is one step that we can take to prevent begging. If more people come out and take a pledge that they are not going to give a single penny to any beggar, irrespective of their need, the photographer is sure, beggary will then be completely uprooted from our country. Meanwhile, let the government continue with its poverty alleviation schemes and make India a better place to live in", the photographer says. India is a land full of stories. On every street, on every corner and in the many places in India, life is rushing by you as a photographer with millions of stories to be told. In the archive story above, you hopefully had a readable insight in the story that was behind the photo of an Indian beggar woman in Mumbai. On this website of Kristian Bertel | Photography you can find numerous travel pictures from the photographer. Stories and moments that tell the travel stories of how the photographer captured the specific scene that you see in the picture. The photographer's images have a story behind them, images that all are taken from around India throughout his photo journeys. The archive stories delve into Kristian's personal archive to reveal never-before-seen, including portraits and landscapes beautifully produced snapshots from various travel assignments. The archive is so-far organized into photo stories, this one included, each brought to life by narrative text and full-color photos. Together, these fascinating stories tell a story about the life in India. India, the motherland to many people around the world, a land of unforgetable travel moments. The archive takes viewers on a spectacular visual journey through some of the most stunning photographs to be found in the photographer's archive collection. The photographer culled the images to reflect the many variations on the universal theme of beauty and everyday life in India. By adding these back stories the photographer's work might immensely enhanced the understanding of the photographs.